Dracula’s America: Shadows of the West: A Wargame is a new set of rules from Osprey Publishing. They work on three levels. The first is as a set of rules for handling skirmish conflicts in the Old West. The second is as set of rules for handling campaigns involving such skirmishes. The third is as a campaign setting which brings elements of the supernatural and the gothic to the Wild West. As with the publisher’s Frostgrave, the buy-in for this game is no more than ten figures per side, and as with Frostgrave, players are free to use the miniatures of their choice, though Northstar Miniatures manufactures the official range of miniatures. The likelihood is that the official miniatures will be worth obtaining once the players decide to add the supernatural elements of Dracula’s America to their games. In addition, players will need to provide whatever scenery they want to play as well as six each of six-sided, eight-sided, and ten-sided dice, along with various tokens to indicate various statuses and a deck of cards for each player. A good playing surface, roughly equal to the size of a kitchen table will also be required. Each player in Shadows of the West controls a Posse of between six and ten figures, typically led by a Boss. Each figure is armed with the weapons it carries and is either a Novice, a Veteran, or a Hero. This determines the dice type a player rolls for each type, six-sided for Novices, eight-sided for Veterans, and ten-sided for Heroes—and represents each figure’s Rank of Grit. These dice are rolled in various tests, including disengaging from combat, shooting, fighting, and saving against hits. A success in any test is counted as a result of five or more on each die, though modifiers can adjust the results on each die. Any die which comes up the maximum result allows a player to reroll the result of a failed die (rather than allowing the successful maximum die to be rolled again). Only one success has to be rolled for a figure to succeed in an action, though in combat successful hits can be countered by successful saves. Successful hits which are not stopped will inflict damage—up to two hits will render a figure Shaken, three or four hits will Down a figure, and five or more will remove them from play as a casualty. Like other Old West or Wild West games, initiative in Shadows of the West is handled through cards rather than dice. On a turn, each player draws a hand of cards from his deck—typically equal to half the number of figures he has in his Posse—and then uses these cards to determine the order in which his figures are activated during the Action Phase. This is a fairly straightforward mechanic and provides the players with the means of better controlling when their Posses act than dice would. The rules to Shadows of the West are in general and straightforward to understand and play. Besides the basics, they cover maintaining Lookouts, handling Bystanders and NPCs, using dynamite, horses, unexpected events, and so on. The advanced rules also cover building a Posse, choosing a scenario, and setting up the table. To support this, guidelines cover special rules for scenarios and some seven sample scenarios. The latter includes staking claim to particular objectives, grabbing loot, having a straight shootout, and so on. So far, so good, but whilst the core rules to Shadows of the West are not complex by wargaming standards, they are not quite suited for pick and up play by beginning, or at least, younger players. That said, they are not difficult to teach and really only represent a step up or two in terms of complexity when compared to the beginning rules of Frostgrave. The second level for Shadows of the West, the campaign rules, allow the players to each take a Posse and play multiple scenarios between them, each scenario having the potential for lasting effects beyond its play through. This includes injuries that might leave a member of a Posse with an old wound that will not go away and acquiring experience which they can learn from, either in the form of a new skill or going up a rank in terms of Grit. A Posse also earns income from other activities and may have other encounters, which like the agendas given earlier in the book, add more flavour to the game than is found in the scenarios given earlier in the book. Similarly, a player can hire Hired Guns—Doc, Moonshiner, Preacher, Prospector, and so on—which serve in a Posse, but are not officially part of it. Again, these are slightly more interesting than the options available to the actual members of a Posse, at least until a member gains experience and can roll for Advancement and so gain a skill. Overall the campaign rules add only a limited amount of complexity to the game, but they do add more flavour to Shadows of the West especially once a Posse has played through a few games. The third level to Shadows of the West is ‘Dracula’s America’ and adds the gothic and the supernatural to the post American Civil War continent of North America. There are two divergent points to this alternate history. One is the arrival of Dracula in the USA in the 1840s and his eventual insinuation into Abraham Lincoln’s cabinet as a military advisor in 1861. The other is a cease-fire called between the North and the South in the aftermath of the battle of Gettysburg in 1863 which eventually turns into a bloody guerilla war rather than all out fights as before. The assassination of Lincoln and his cabinet leaves room for Prince Dracul to first assume control of the North and then be appointed President-for-Life of the United States, forming the so-called ‘Shadow Union’. President Dracul’s Winter Address would attract dark creatures from the Old World to the New World as resistance movements against him are founded—led by General Ulysses S. Grant in the North and by General Robert E. Lee in the South. Across America, Edward Crowley, businessman, philanthropist, and secret Grand Magister of the Crossroads Cult lays an intercontinental railway to begin about the Great Ritual and disrupt the Balance of Nature, but his efforts are disrupted by the Skinwalker Tribes led by the mysterious Shaman known as White Raven. General Jebediah Craine, commanding newly learned secrets of Vodou raises the first Revenants and establishes the Dark Confederacy to attack the North as refugees flee from back East to the West in order to escape Dracula’s terror. Six factions—essentially organisations around which players can build their Posses—are vying for a ‘better’ America, each capable of fielding powerful and different allies. The Templar-like The Twilight Order has access to blessed arms and ammunition; the Red Hand Coven are thralls of Dracula and the Shadow Coven and are thus supernatural, hard to kill, and can feed on bystanders or or downed Posse members to restore themselves; and the Skinwalker Tribes whose members can sometimes transform into bears or wolves. Some of the Crossroads Cult are Magisters capable of summoning infernal creatures, whilst others are Harbingers of the Abyss; the Congregation is comprised of ex-slaves and Abolitionists opposed to the Dark Confederacy whose members can sometimes be possessed by the Loa; and the Dark Confederacy are necromancers and raise Revenants. In game, these are reflected by two members of each Posse possessing the specific arcane powers of the faction the Posse serves. In addition to Posse members with faction-related or Arcane powers, a Posse can also include an Arcanist amongst its members. An Arcanist can cast Arcane Powers from Arcane Blast, Bless, and Dispel to Summon, Transfix, and Warding Circle, the casting roll using the same mechanic as combat. Essentially, a player needs to roll a number of successes equal to the casting difficulty of each Arcane Power for the Arcanist to successfully cast it. An Arcanist starts play with three Powers, but can learn more with Advances. The most notable of the Arcane Powers is Summon, for which an Arcanist can summon supernatural creatures such as Hellhound, Seraphim, and Swamp Baka. These are in addition to ‘Unwelcome Guests’, supernatural creatures which might be encountered as a result of a random supernatural event or Supernatural Hired Guns a Posse might employ, like a Maverick Arcanist or Stitch-Doctor. Physically, Dracula’s America: Shadows of the West: A Wargame is sturdy hardback, well written and nicely illustrated, with both fully painted artwork and photographs of miniatures in play. Reference tables are provided at the back of the book for easy play, but an index would have been a useful addition. Dracula’s America: Shadows of the West: A Wargame presents an intriguing setting and the idea of fighting vampires and other threats or fighting as vampires and other threats sounds a lot of fun. The mechanics also nicely build up to this idea, taking players step-by-step from one level to the next, giving everything the players would want, at least mechanically. Whilst the rules themselves are solid and playable, easily grasped by anyone with some gaming experience under their belt, where Dracula’s America: Shadows of the West: A Wargame is really lacking is depth to the background and what the objectives are of each faction. This makes it challenging for players to develop scenarios beyond those given in the book, which it must be said, are a little bland themselves. The random encounters are more flavourful in terms of background. The lack of objectives is perhaps the book’s biggest disappointment because they would really give a drive to the gothic in the Wild West and something to fight for by the various Posses. 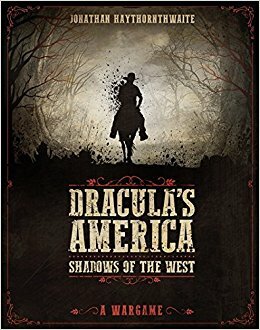 Overall, Dracula’s America: Shadows of the West: A Wargame provides a solid set of rules, but really needs more background and more detail to bring out its flavour and its promise.